Yurts were traditionally made in small workshops by specialist yurtmakers, known as u'yshi. In the past there were a multitude of yurt workshops throughout the Aral Delta, often located close to a river and a local source of timber. For example there are records from the late 19th century mentioning a yurt workshop to the south-west of Shımbay located on the west bank of the Kegeyli River. Aleksandr Melkov visited a yurt maker in Shımbay region in 1929 and collected some of the specialist yurtmaking tools. He also acquired a yurt frame which was subsequently shipped to the Museum of the Ethnography of the Peoples of the USSR in Leningrad (inventory number 5111-1-139). 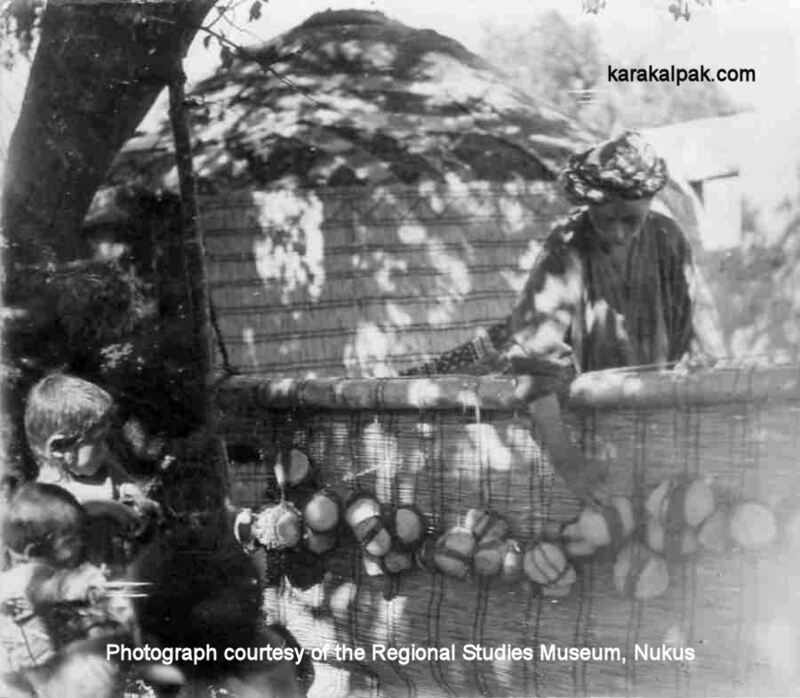 Around 1950 Zadykhina encountered a yurt that had been made by an Uzbek master at Qıpshaq in southern Karakalpakstan in the early 1930s. In the past there were many other yurtmakers working in this region. In the very same year of 1929 the Sixteenth Conference of the Soviet Communist Party adopted the first Five-Year Plan. It was dubbed the "Second Revolution", designed to eliminate private property and transform traditional ways of living and working. Its main impact in the Karakalpak Oblast was on private landowners and farmers, whose land and livestock was confiscated and collectivized. However it also affected all of the small private yurt workshops, which were also nationalized and became swept up within new regional industrial combines or artels. 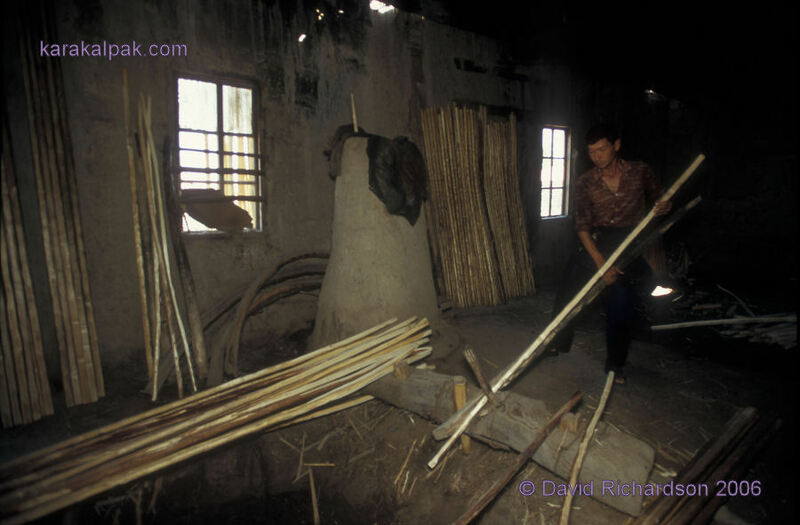 Other components for the yurt, such as shiy screens and tent bands, were not manufactured in workshops but in the home. It was traditional for a future bride to make all of the yurt weavings as part of her dowry. Even so, some craftwomen did specialize in certain crafts and took on orders for friends and neighbours or sold their produce at the bazaar. 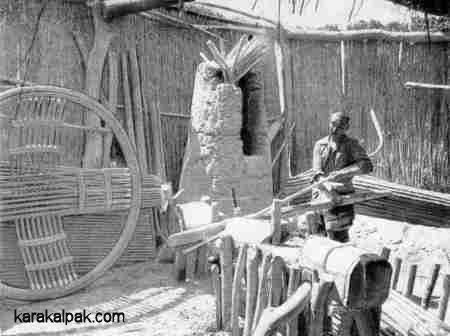 Karakalpak shiy making in the 1930s, in the garden next to the yurt. Even in the 1960s there was still a strong local demand for yurts within the Karakalpak ASSR and the main workshops could be found in the Qon'ırat, Xojeli, Shımbay, and Kegeyli regions. They did not specialize in particular ethnic designs, but produced Karakalpak, Qazaq, and Turkmen yurts according to demand. Even an Uzbek yurt could be made as a special order, although the requirement for this style was by then almost non-existent. Traditionally yurtmaking was a family business and sons were taught by their fathers, the usual apprenticeship lasting from 3 to 4 years. It was obligatory for the master to hand over at least one of his tools to his apprentice. 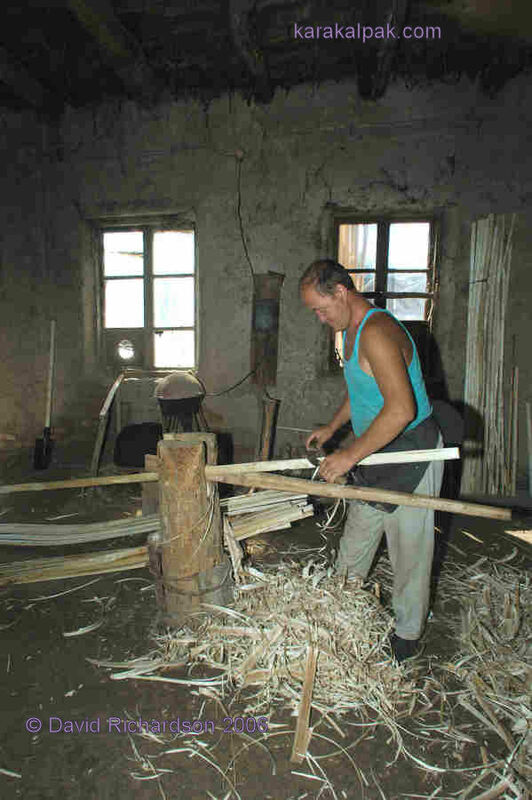 In 1960 Qıdır u'yshi Ernazarov, the Karakalpak yurt master at the Shomanay Industrial Artel in Xojeli rayon, was 75 years old. He had been taught by his father who had been a yurtmaker in Kegeyli village until his death in 1905. Qıdır's father, grandfather, and great-grandfather had all been professional master yurtmakers. The Qon'ırat artel, which at that time was annually producing 150 yurts, had two masters, Qoblan Borabaev aged 70 and Nawrızbay A'limbetov aged 78. Qoblan had been taught by his father, who in turn had been taught by his father, who had been a yurtmaker at the Shımbay workshop. 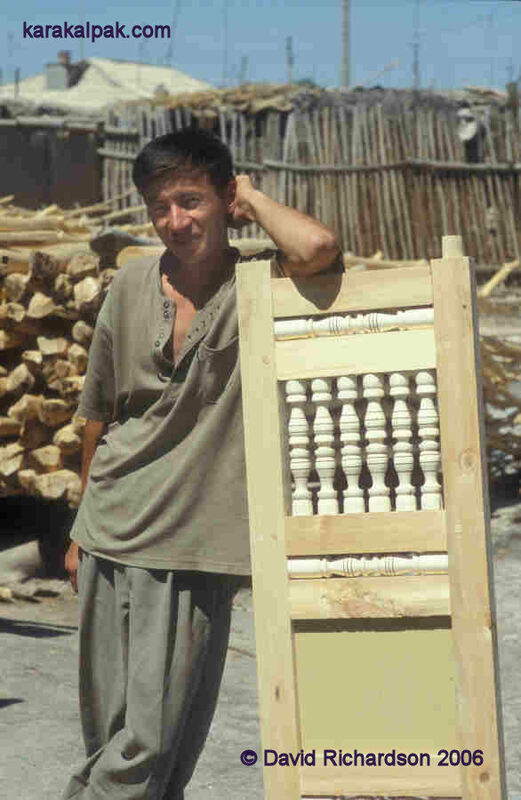 Initially taught to make Qazaq yurts in Qon'ırat, he next learnt how to make Karakalpak yurts under a master from Shımbay, then Turkmen yurts under a master in Urgench, and finally was taught to make Uzbek yurts by an Uzbek master in Qon'ırat! Karakalpak yurt maker's workshop at U'yshi awıl in 1976. The roof wheel is Qazaq. In 1965 a Qazaq named A'met u'yshi was making yurts at Zayır, close to the right bank of the Amu Darya. In Shımbay the Karakalpak u'yshi Qazaqbay O'temuratov was building yurts in 1969, while Mirzabay was working in the same town in 1972. Another important yurt workshop was based at Qızıljar (Red Cliff) on the left bank of the Amu Darya, close to Qon'ırat. One of the more recent traditional centres of yurt production was at the aptly named U'yshi village in the territory of the State farm "Erkindarya" in Kegeyli rayon. As the waters of the Amu Darya lessened, the vegetation changed and the supply of building material dwindled. According to Esbergenov, most of the yurtmakers were forced to move away to Qon'ırat, Shımbay, and other locations. This was confirmed to us by a family we visited in Erkindarya whose yurt was made in U'yshi in 1979, which they described as being a village of yurtmakers about 30km to the west on the banks of the Amu Darya. They told us that yurtmaking ceased there in 1985 due to the shortage of water. The impact of the various changes to the river system was further brought home to us when they explained that there had also been a fish smokehouse in U'yshi village until 1953 when it was destroyed during a flood and was never rebuilt. 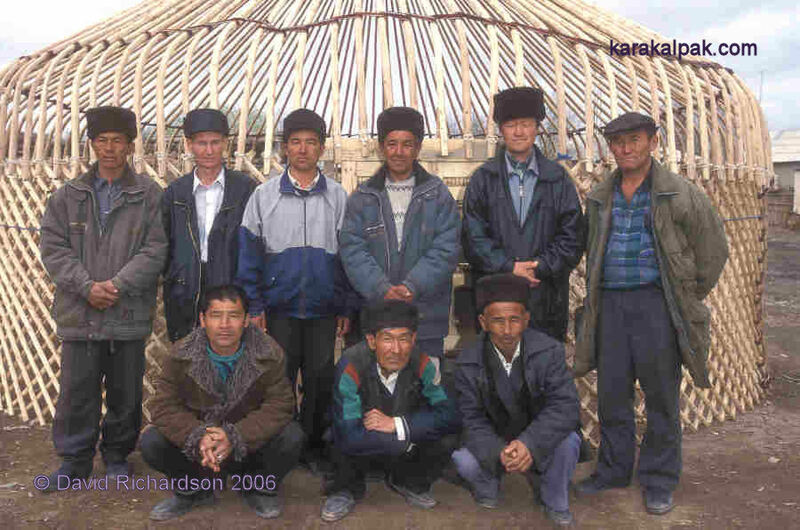 In 2004 we visited a family in Bozataw whose late father had been the local yurtmaker. The last yurt was made there in the late 1990s. His son went to study in No'kis and did not take up his father's profession, but he was able to show us some of his tools. 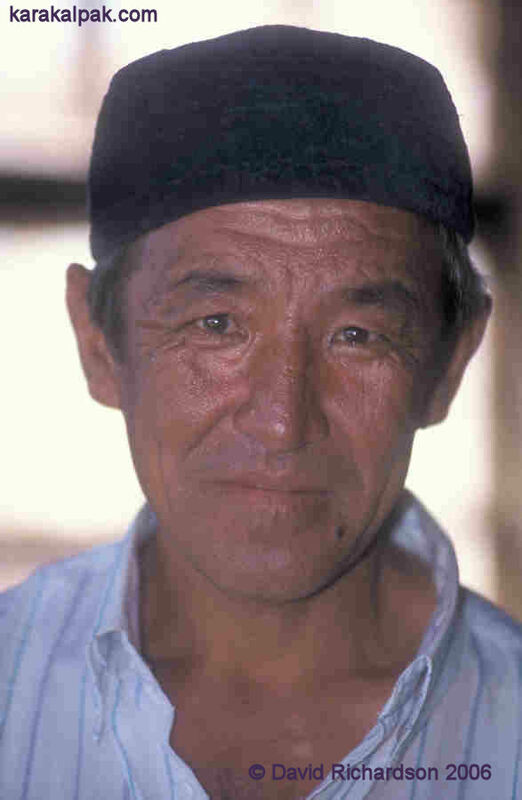 His father made both Qazaq and Karakalpak yurts. The only remaining working yurtmaker that we have been able to track down in the delta so far is Quwanıshbay Sanqıbaev from Shımbay. We were introduced to him by Marinika Babanazarova, the Director of the Karakalpak State Museum of Art, since he had made the yurt which forms part of the ethnographic exhibition in that museum. We have now visited Quwanıshbay several times, during both busy and quiet periods, as well as at different times of the year. We are very grateful to him for the amount of time he has spent with us explaining the answers to our many questions. Quwanıshbay Sanqıbaev, the Qazaq u'yshi from Shımbay. His workshop is located in a Shımbay backstreet. Double gates open into a large yard stacked with various types of local timber. Flat-roofed single storey adobe buildings surround the yard. As you enter the separate workshops and store rooms, each lit by a single small window, it takes a while for your eyes to adjust from the bright sunlight outside. The floors are just bare earth and there are no machines. The few pieces of equipment that are in evidence look simple and primitive. Yet it is clear from the inventory of finished parts that the workshop is very effective at turning out yurts. Quwanıshbay decided to become a yurtmaker after secondary school and trained for one year. This seems to have been short as the usual period of apprenticeship used to be three to four years. The yurtmaking profession is open to anyone and is not restricted to any specific clan. Quwanıshbay began to make his own yurts in 1970. Eleven men are employed in this workshop and business is often slow. However on one of our visits they were busy completing a large order for five yurts to be used at a bar in Tashkent! Quwanıshbay with some of his yurtmakers in front of their latest yurt frame. Quwanıshbay is ethnically a Qazaq, but he makes both Qazaq and Karakalpak style yurts depending on the preference of the customer. He has been able to show us the fundamental differences between these two types. Uwıq Bent so that the roof seems hemispherical. Decorated with a row of grooves at the top. Straighter so that the roof appears cone-like. the same as the Uzbek and the Kyrgyz yurt. the same as the Turkmen yurt. Shan'araq Single wooden ring, usually decorated with carving. No decorative �arrows�. Two concentric wooden rings, generally plain. Four sets of three decorative arrow shapes. and a Qazaq shan'araq on his left. Yurts now come in mainly three sizes: 6, 8, and 12-sections or qanats. In the past 4 or 5-section yurts were more common but now the main requirement tends to be for larger 8-section yurts, often because families are bigger. In 2002 the price of a 6-section yurt was about 70-80,000 som to purchase locally (about $200) and it took between 4 to 6 weeks to make. Modern yurts are not the same as traditional yurts. The old varieties of wood are no longer available, it is hard to maintain traditional skills when demand is so low, and there are no longer the wealthy landowners to patronize the finest masters. For example old people in the Kegeyli and Shımbay regions told researchers from the Khorezm Archaeological and Ethnographic Expedition that in the olden days the upper part of the kerege of yurts belonging to wealthy bays was decorated with carved bone and silver. and a shan'araq with a diameter of 1.9 to 2.0 metres. and a shan'araq with a diameter of 2.2 metres. The biggest 12-qanat yurt has a diameter of 9 metres. The patron of yurtmakers was Ibrahim Ha'lil, supposedly the maker of the first yurt in the world. Before they began to make the wooden parts of a yurt craftsmen had to be familiar with the risa'le or regulations which governed all yurtmakers. It seems that each craft had its own set of risa'le, perhaps similar to the guild system. These regulations covered a variety of subjects including honesty and the cleanliness of the workplace. Before beginning to make the yurt frame (kerege) the yurtmaker made his ablutions and prayed. His wife fried bawırsaq (diamond-shaped pastries) and distributed them among their neighbours. The yurtmaker then requested the permission of Ibrahim Ha'lil to begin work. We wonder if there was any relation between the diamond-shaped pastries and the diamond-shaped kerege ko'z or "eyes of the kerege"? Wood seasoning in the outdoor yard of the Shımbay yurtmaker's workshop. Quwanıshbay's yard is always full of aq tal and qara tal wood from local suppliers, seasoning in the open air. He told us that in the past he used janewut (Salix songarica Andersson) which he compared in strength to iron or steel. A yurt made from janewut lasts for 100 years; but one made from qara tal lasts only 20 years. 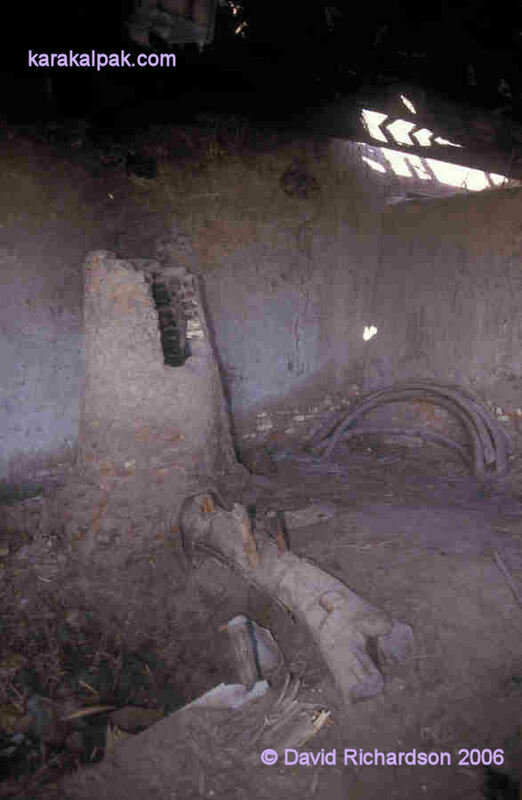 Janewut was also used for ceiling beams in houses. Janewut was an endemic species, which grew wild in the tugay forest, reaching a maximum height of only 3 metres. At one time it was even cultivated. It was quite different from aq tal and qara tal, being more slow-growing, and the wood was not so straight. It took 5 years for janewut branches to reach the same size that qara tal reached in 3 to 3½ years. Quwanıshbay had no idea why there are no janewut trees left, although local botanists have told us that increasing soil salinization has eliminated most of the endemic plant species from the delta. A recent survey showed how rare it has become, now making up less than 1% of the forest cover and growing only in the part of the forest near the Amu Darya river in the Bada Tugai. Special forest conservationists started to plant janewut in the Badai-Tugai forest reserve in 2000-2001. Quwanıshbay now uses aq tal for the shan'araq as it bends more easily and qara tal for the kerege and uwıqs as it is stronger. The wood is allowed to dry for one month. If it were left longer it would become too dry. When they are ready to begin work they soak the poles that will be used as uwıqs (the struts which connect the lattice walls to the roof wheel) in water covered with wood shavings to prevent evaporation. In the next process they are heated in a tall thin oven called a morı for 3 to 4 hours. The morı is heated by hot gases fed though an underground pipe from a charcoal fire burning in a nearby earthen pit. The wood becomes softer due to the smoke and heat and can therefore be bent more easily. The poles are bent by means of a tez, located next to the morı. The tez is basically a stout wooden log positioned on the edge of a deep pit and fixed to the ground by means of large wooden and metal pins. Two strong pegs protrude from holes drilled in the top of the log � these are usually wooden pegs but in some cases a metal spindle from an old piece of machinery is used instead. The pole to be bent is taken from the oven and placed between the pegs, one end pointing down into the pit. It is then forcibly and progressively bent to form a short arch using a heavier wooden pole for leverage. This is hot and backbreaking work. As the poles are bent they must be constantly checked against a pro-forma pattern piece. You can hear the wood cracking as it is bent and afterwards the bent pole looks almost broken. Bending a heated pole to create the curved section of the uwıq. Now the bent poles must be hand-planed. Instead of a mechanical vice the workshop has a number of stout wooden logs sunk into the ground, their tops protruding vertically from the floor by about one metre. A u-shaped notch has been cut into the top of each log. The yurtmaker takes each bent pole and places it in the notch. He then uses a second heavier pole to wedge the first pole in place, using his thigh to create leverage. This leaves both hands free to plane the uwıq using a sharp spoke-shave. The bent poles are held in a simple vice to be planed. The bent poles are planed with the spoke shave to produce the finished uwıqs. 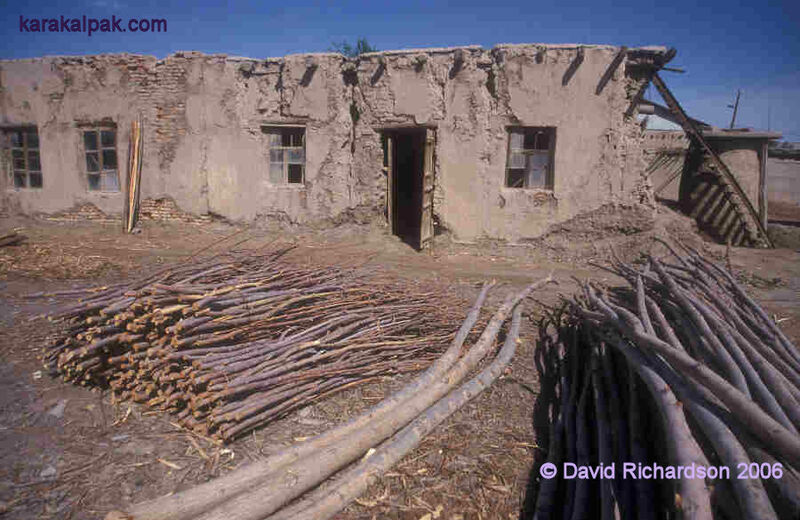 The shorter poles (known as sag'anaq) that make up the qanats also have to be bent, but only by a small amount. This is so that the qanat forms an arc when it is opened. After planing and drilling, the slightly bent sag'anaq are joined using strips of wet camel hide. These fastenings are called qam ko'k or qam qayıs, the word qam pertaining to raw and qayıs meaning strap. The camel hide, which is stronger than cowhide, is bought on the market. Some of the finished parts (uwıqs, qanats etc.) are retained as patterns for the future. At present the workshop usually makes 6 to 8 eight-qanat yurts a year. Between 1989 and 1991 they made up to 14 a year. The roof wheel is made of heavier gauge wood but is bent in exactly the same way. 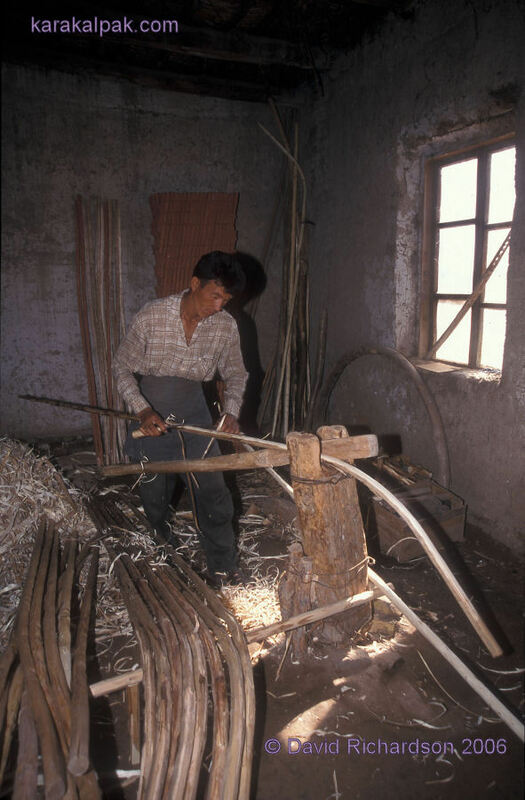 Three bent sections, known in English as fellies, are used to make each wooden wheel. The exact shape is obtained by matching them against a circle drawn with a large pair of wooden compasses known as a palger. The fellies are scarfed together and the joints are held in place with stout metal wires. They were traditionally joined with a binding of rawhide, a process known as iskenje. Red clay from Qırantaw is used as a preservative and a wood stain. The wooden frame is sometimes covered in red clay (josa) as a preservative and colorant. This comes from Qırantaw and is believed to also provide protection from woodworm. According to Quwanıshbay animal blood is sometimes used instead, but we were unable to verify this with any other sources. We know that some museum and tourist yurts (such as those at the Ayaz qala yurt camp) are painted with red gloss paint instead, which is definitely not traditional. The workshop makes the yurt frame but not the door due to the longstanding belief that a yurtmaker would die if he made all of the parts of the yurt. The doors of Karakalpak yurts were often plain and undecorated. Carving and, in particular, painting of the doors in bright colours became more popular in the 1940s and 1950s. In the 1920s and 1930s this had been considered to be "Qazaq taste". The yurt doormaker from Shımbay with a new yurt door leaf. We were introduced to the local Shımbay carpenter who made the doors for Quwanıshbay's yurts. According to Savitsky some craftsmen preferred to use Amu Darya willow (Salix oxica, known locally as sog'ıt), or pine (qarag'ay) for the door panels. According to our research sog'ıt was indeed used for door panels but its botanical name is Salix alba. Salix oxica is in fact aq tal. It also seems strange that he refers to the use of pine, as both pine and birch (qayın') are generally considered by the Karakalpaks to bring misfortune and sterility. The cutting pattern for one of the roof felts marked out in the yard. The yurtmakers workshop also cuts out the shapes for the three roof felts. The felt is bought on the market in Hazarasp or is imported from Turkmenistan. There is only one former sovxoz near To'rtku'l (Ilyich) which still makes felt in Karakalpakstan. The yurtmakers mark out the shape of the felt on the ground in the workshop yard using white paint and use this as a pattern for cutting the felt. The shiy screens used to be made by yet another expert from a nearby village. They could be decorated and a complete set could take from several months to a year to make. Unfortunately the shiy screen maker died in 2003 so the workshop now purchases them from the Shımbay Sunday market. They also know of someone still making screens near Qazaqdarya. Karakalpak shiy making in a shady corner of the garden, probably during the 1970s. In the past these screens were made from the stems of the tall and slender perennial steppe grass, shiy - Lasiagrostis splendens (Trinius) Kunth, also known as Stipa splendens Trinius or Achnatherum splendens (Trinius) Nevshi, sometimes called chee grass in English. Shiy occurs widely across Central Asia, from European Russia to Northern India, Mongolia, and China, where it forms dense tussocks. It is valued for its strong, tall, and slender stems, which grow up to 2½ metres tall and are ideal for matmaking. Herbert Wood commented on the alluvial islands in the Amu Darya close to Khiva in 1873, whose covering of young willows was hidden in the summer by thick crops of high golden-eared waving grass (Lusiagrostis splendens [sic]). A little later Henry Lansdell encountered it growing on the banks of the Amu Darya just upstream from To'rtku'l. Unfortunately this plant is no longer common in the Aral Delta as it cannot cope with the increasingly high levels of salinity, despite being a salt-tolerant species. Today the screens are made of reeds, yet still retain the name 'shiy screens' regardless of the material from which they are made. 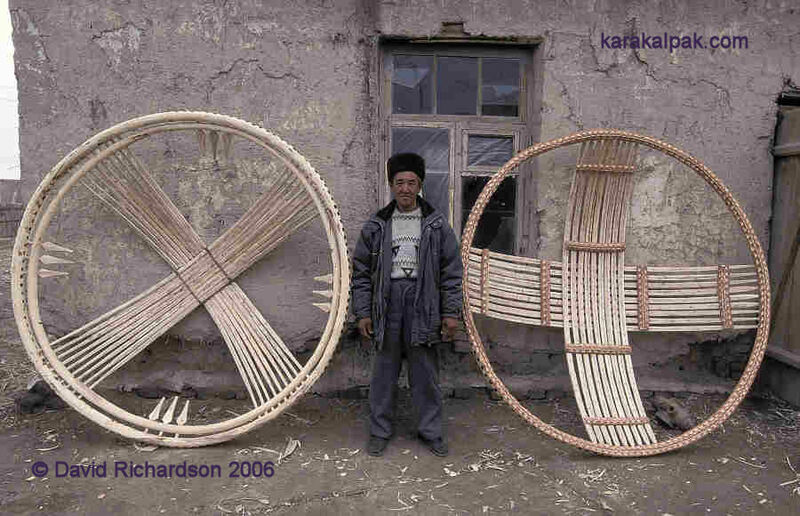 They are usually constructed using goat�s wool, which was and still is readily available but needs great skill to spin. Sometimes cotton is used instead but this is more susceptible to weather rot. 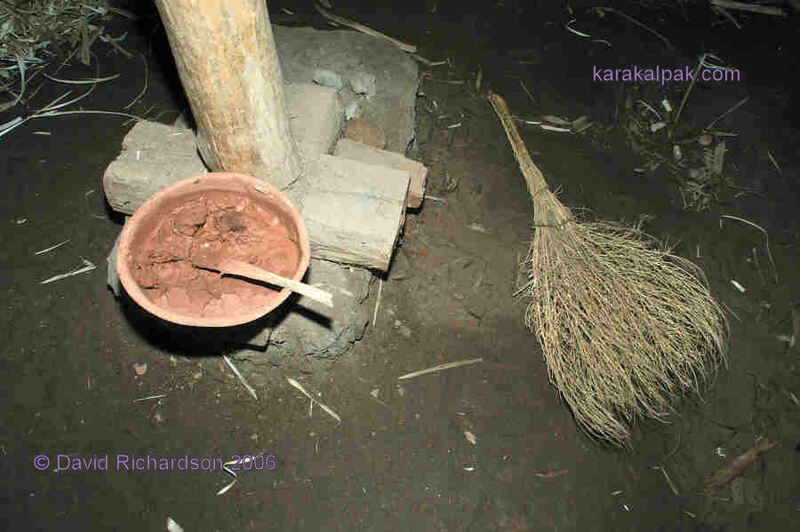 In many Karakalpak villages all of the outhouses and fences for livestock areas are made of reeds. In the past many poor people who could not afford felt for the yurt roof used reeds instead. Indeed some of them inhabiting the northern delta even built yurt-like dwellings entirely out of reed. Gu'lxan apa working on her jez shiy. We have visited two women who made different types of shiy screens. 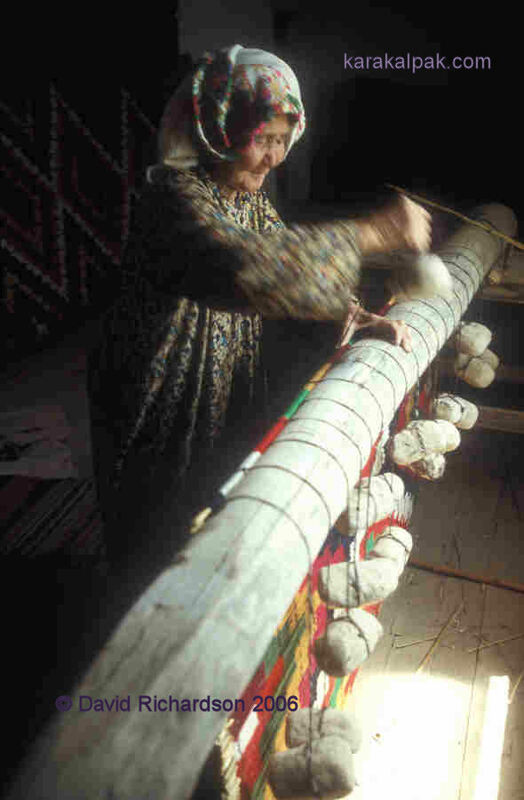 Gu'lxan apa (from the Qon'ırat Jawıng'ır-Tiyekli clan) was born in 1926 but did not learn to make shiy screens until she was in her forties. She makes jez shiy � screens where the reeds are wrapped with wool to form a pattern in the same way as Kirghiz reed screens. She told us that she believed the Qazaqs learnt this from the Karakalpaks. Esbergenov mentions the use of jez shiy screens on either side of the yurt door instead of the shiy o'n'ir. However Gu'lxan apa told us that jez shiy were used internally, as they would fade if used externally. 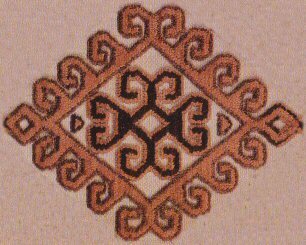 Anna Morozova writing somewhat earlier than Esbergenov asserted that Karakalpaks did not produce patterned screens from shiy, tied with coloured wool and silk thread. She believed that in the past rich Karakalpak families bought such screens from Qazaqs. 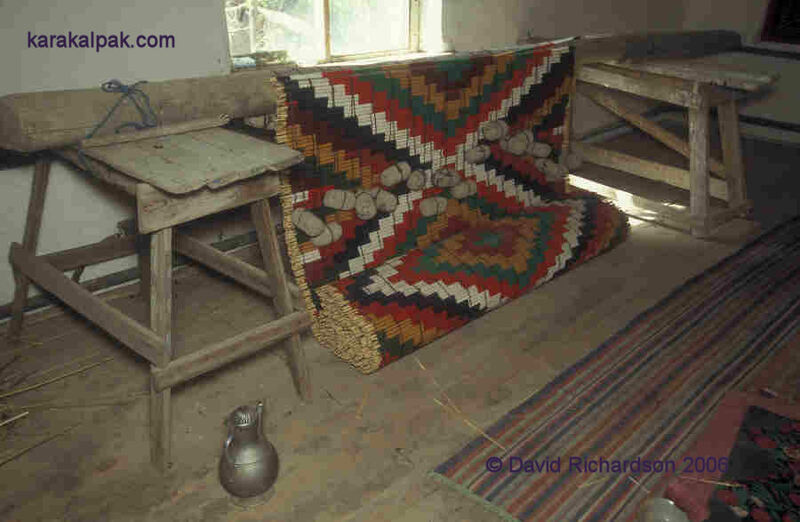 However Shalekenov, writing in 1966, stated that Qazaqs living in the vicinity of Karakalpaks made reed doors with patterns from different coloured wool �on the Karakalpak model�. We have only seen a limited number of jez shiy screens and have been unable to ascertain their provenance. To the best of our knowledge there are none in museums that can be specifically verified as Karakalpak so this remains an area of doubt. According to Gu'lxan apa in the past a special kind of jez qamıs was used which is now no longer available. Now she uses ordinary reed which is known as qamıs. Jez qamıs was not hollow like qamıs and was very fine � about half the diameter. It was stronger and its surface was polished like qamıs. It used to grow on high land, whereas qamıs grows very close to water. It was much shorter (about 1.2 metres) and two pieces had to be joined together to get the right height. Her children collect the qamıs. The qamıs from watery fields is not very good and the best qamıs grows away from the water. The qamıs is sorted by length and diameter. The leaves are removed and it is washed. Pairs are selected for wrapping and are first tied together in the centre, at the ends, and in between. She always wraps from the centre and uses this as a reference point. She only makes one particular pattern which is typical for shiy. Because the rhythm of this pattern consists of 3 elements she prepares them in one set, weaves them first, and then does the next set. It takes one week to do one diamond and about one month per screen. When we visited her she was making a screen for her daughters so that they would have something to remember her by when she was no longer with them. Spinning goat hair for making shiy screens. She uses goat hair to bind the qamıs, which has previously been wrapped with coloured wool, together. This is stronger than sheep�s wool and resists sunlight better. She spins the goat hair herself � the family breed sheep and goats. She separates the two types of goat hair before spinning, therefore some of the threads have a barbershop pole effect. It seems she mainly uses the dark hair but uses the lighter when that runs out. She usually spins two balls of goat hair in one day. After she spins them she plies two balls together. She puts this thread in water (it doesn�t matter what temperature and nothing is added) for a certain length of time which she said was secret. This made the thread even stronger. If this was not done the thread could un-spin itself. She buys the coloured wool from Xojeli bazaar on a Sunday and in 2004 it cost 2,800 som for one kilogramme. The shiy a'gash trestle with a colourful Karakalpak jez shiy screen. The top piece of wood is called the shiy a'gash or shiy pole. Any suitable piece of wood can be used but it has to be straight. Special grooves are cut to keep the �warps� the correct distance apart. The weights (awırlıq) used for tensioning the strings are made of mud, rice husks, and wool. It was her idea to add some wool as it makes them stronger. The strings are in pairs with about five metres per side. 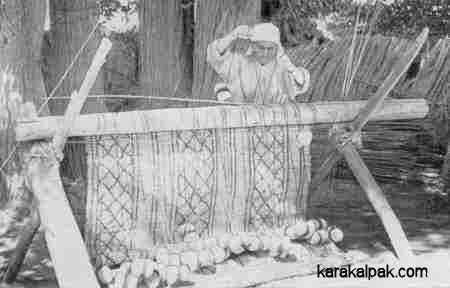 She only moves every other set of stones for each set of qamıs, thereby imitating a twill pattern. A new jez esik roll-up door cover made by Gu'lxan apa. Minayım Da'wenova (from the Qon'ırat Mu'yten-Teli clan) used to work at the Regional Studies Museum. She made the shiy screens for the yurt which now forms part of their exhibition. She was taught this craft by her mother. 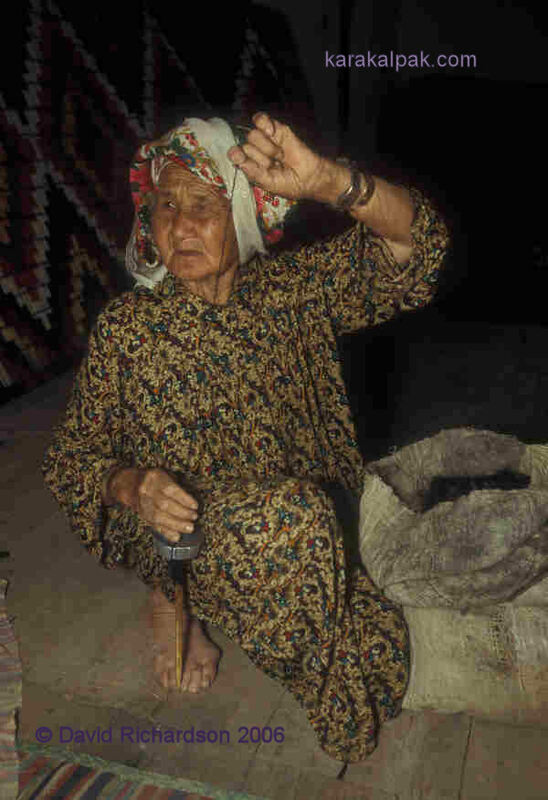 Minayım moved to No'kis in 1968, but before then she lived with her parents on the Qazaqdarya river, close to the coast of the Aral Sea in Moynaq rayon. There was, of course, a plentiful supply of reeds in that area. Instead of shiy she used qamıs of less than one centimetre in diameter. Stones as big as a hand were used to create enough tension. The simplest screens just had straight lines of goat hair holding them together but ones with zigzags and other geometric patterns were also available. 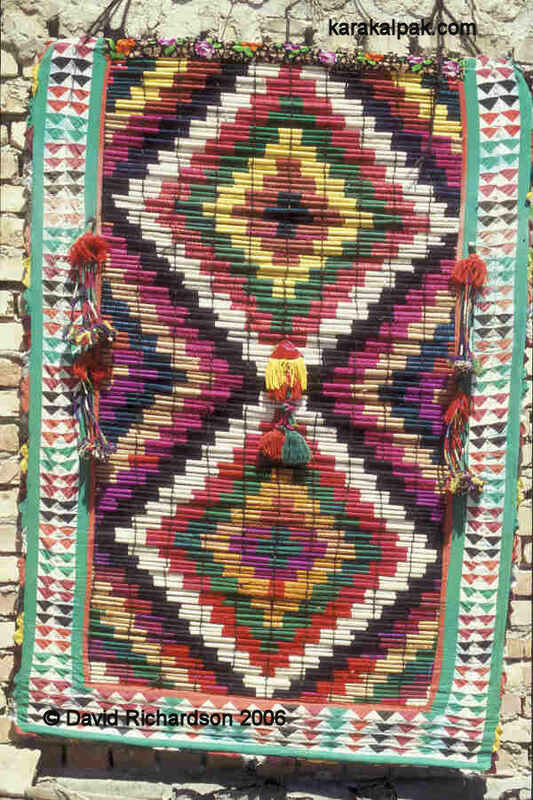 Wealthy people could order a jez shiy screen with the qamıs wrapped in coloured sheep's wool in a particular pattern. Mosquitoes could not get in through a carefully woven shiy screen. However moths were a problem for shiy wrapped with sheep�s wool. They were not a problem if the shiy had been wrapped with goat�s hair. Esbergenov, X., Chapter 1, Settlements and Dwellings [in Russian], in Ethnography of the Karakalpak from the 19th to the beginning of the 20th century, Published by Fan, Uzbek SSR, Tashkent, 1980. Kudiyarov, A. R., History of the Town of Chimbay 19th to the beginning of the 20th century) [in Russian], Doctoral Thesis, Institute of History, Archaeology, and Ethnography, Academy of Sciences of Uzbekistan, Karakalpak Division, No'kis, 1999. 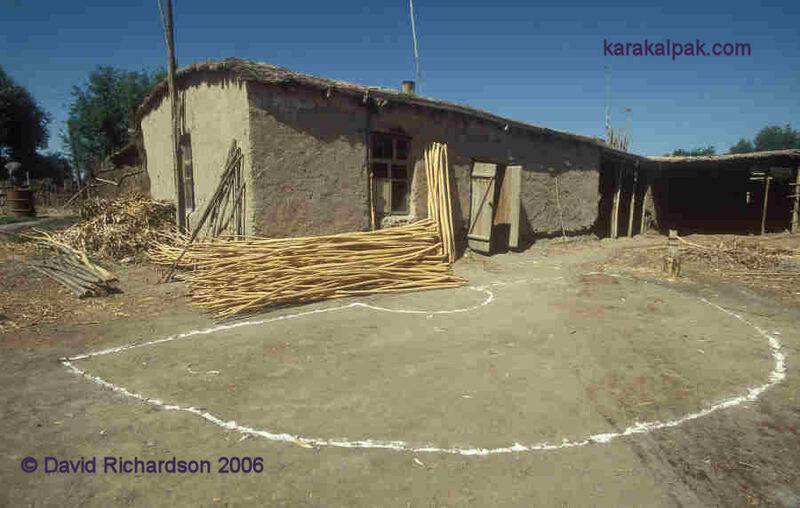 Tlewbergenova, N., A propos des habitations Karakalpaks [in French], in Karakalpaks et autres gens de l'Aral, Published by Edisud, Tashkent/Aix-en-Provence, 2002. Wood, H., The Shores of Lake Aral, Smith, Elder & Co., London, 1876. Xalmuratov, P. X., Dean of Botany, Institute of Pedagogy, No'kis, Karakalpakstan, private discussions, 2003 and 2004. Zhdanko, T. A., Ornamental Skills of the Karakalpak People [in Russian], Material and Research on the Ethnography of the Karakalpak, Part 2, pages 373 to 410, Published by the Academy of Sciences of the USSR, Moscow, 1958. This page was first published in May 2006. It was last updated on 6 March 2012.